Ruby, you are just the cutest! You look beautiful in B&W! Hap-Pee B & W Sun-Day! Slurp slurp - love that pink tongue, Ruby! That is the cutest little tongue! Every Sunday around here is B&W with Kaci and me although it's been getting G&B&W because of my grey. The good news is that were members of the pink tongue club also. Very cool photo Ruby! It looks like you were feeling the heat in it, so I hope that you enjoyed this pawesome cooler weather we had today! Enjoy Labor Day! Hey Ruby! Are you giving all of us a smooch? I'd be happy to give you a smooch back! Smoochie kisses to you, Ruby! Yowsers! That is very clever - love it! Your nose looks so shiny. We think your assistant is very clever with the tongue colour. Your ma needs to put an ice cream cone in front of your cute tongue, Ruby! We love this picture! Wow, you have an adorable slurper! BOL Great pix of you. 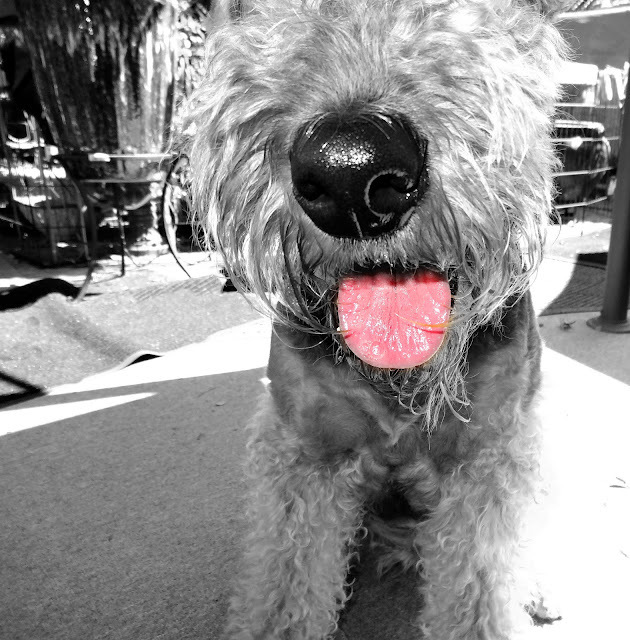 WOW Ruby... your PINK Tongue really looks super with the B & W surrounding it. SUPER picture for SURE. look at that gorgeous tongue! Now your mom can see exactly where to place treats, Ruby! This photo is soooooo cool! How did you get only your pink tongue to have color? I am impressed! Hi beautiful face and big shiny black nose!!!! Bol. This is such a cool pic!! Well Done, Ruby! That's an awesome photo. Your tongue is SO bright! I love, love, love, love, love this picture, Ruby. That tongue's so pink I would swear you've been drinking strawberry daiquiris! And you didn't give me a call? Woooowers!!! What a pretty pink tongue!!!!!!!! Look at that beautiful little pink tongue! Love it! Ruby, you're a beautiful dawg! I saw your comment on Sugar's post yesterday and want to invite you over to enter the contest to win free rabbit jerky from Jones! Beautiful picture Ruby! Congratulations! You've won the pawtographed copy of Victoria Stilwell's book! Mom has sent your mom an email! BOL! What's black and white and pink?!? Ruby with her tongue out in this picture. Ruby, you always make me smile. You are too cute! Look at that beautiful pink tongue!